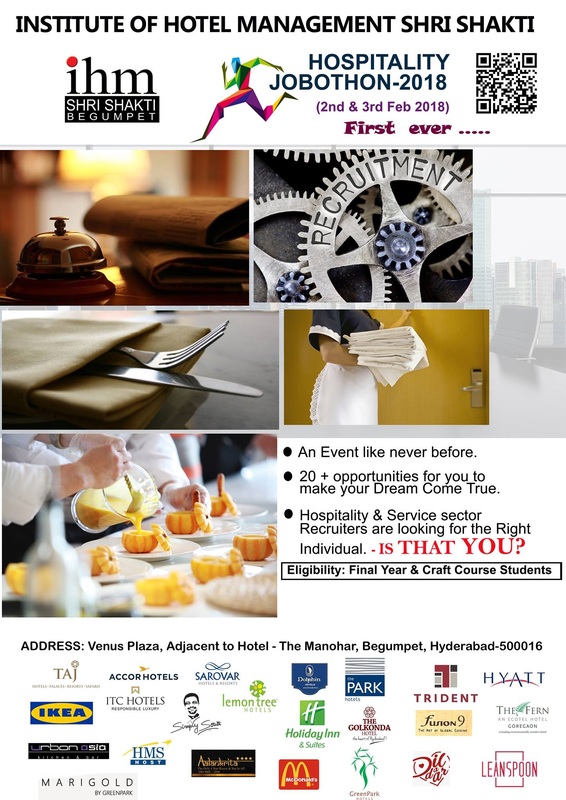 IHM Shri Shakti is proud to host the first ever HOSPITALITY JOBOTHON 2018. More than 20 eminent Hotels, Restaurants & Airlines will be coming for recruitment on 2nd & 3rd Feb 2018 from 9:30 AM to 5:30 PM. In spite of the great scope and demand for young professionals, it is disheartening to note that because of the lack of proper platform, the deserving candidates are not reaching their potential employers & vice-versa. Therefore, utilize this huge platform to build your career. Registration Fee for the JOBOTHON 2018 is Rs 200/-. Registration Fee to be paid to your College Coordinator/ at Venue before 25th Jan 2018.